Mount Mazama blew up and formed one of our favorite national parks. History time! Or what our smelly, finally-figured-out-farming elders once called Mount Mazama, roughly 7,700 years ago. Woah, Kehoe. Crater lake is a lake, not a mountain. What gives? Exactly. 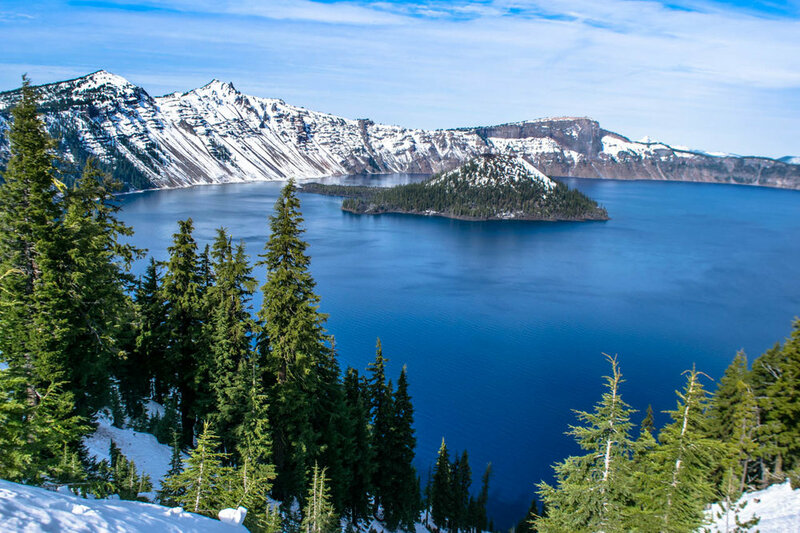 Crater Lake is technically misnamed and is actually resting in a caldera — a collapsed volcano that erupted so violently it caved in on itself, forming a bowl. They say the eruption in 5677 BCE (give or take 150 years) was 42 times greater than that of Mount St. Helens in 1980. And thanks to said eruption, we now have the deepest lake in the US, the second-deepest in North America, and the tenth-deepest in the world. It's really just a giant, giant, giant puddle — it's all rainwater. There are no rivers that flow into or out of Crater Lake. What you see in these pictures is a world-record-worthy, centuries-long collection of snow and rain. With no pollutants flowing into Crater Lake, it's got some of the purest, clearest water in the world. Using the Secchi disk (literally just a black and white disk that's submerged until you can no longer see it), scientists have seen as far as 175 feet down. 175 feet down! (Though it averages around 100 feet.) I've waded in rivers up to my ankles that were murkier than that. And with snowfall being around 40 feet a year, there's no real concern that the lake is going anywhere anytime soon. It's estimated that it contains 4.6 trillion galloons of water, and it's just about all water — that's why it's so frickin' blue. All that snow finally serves a purpose, and it really is an unfathomable amount of snow: It usually melts off in the beginning of August, and the photos you're looking at were taken around the 20th of October. Tell me more about this ancient volcano. Don't mind if I do. Mount Mazama was a helluva mountain up until 7,700 years ago. It's in the Oregon segment of the Cascade Volcanic Arch, and it used to be around 12,000 feet tall. For reference, the rim now tends to hover around 7,000-8,000 feet, meaning the eruption lobbed an entire MILE off the top of this beast. This entire area of southern Oregon (about 80 miles from Medford) is an ancient lava paradise. Mazama in particular went through puberty around 400,000 years ago, and continued to grow and shape and form until about 50,000 years ago. It would then erupt occasionally, go dormant for a while, and then WHAM! All that hard work and growing pains for nothing. It had a little bit more glory and formed Wizard Island (the small island in the lake you can see above), but would always be a shell of its former self. Well, what was once lava tubes. Now that once-hot mess is a river, and a b-e-a-utiful one at that. Southern Oregon, you are blowing our minds. It's almost always winter, and the NPS takes winter seriously at Crater Lake. When I went in late October, the ENTIRE rim was closed off to cars — luckily it was paved for service vehicles so it was still open for walking (which, in a weird way, was better). If you want to hike, swim, and fish (fish were planted there; they didn't appear out of the sky with the rain), make sure to go May-September. If you're down to snowshoe, want to avoid crowds, and aren't afraid of tire chains, (and, honestly, the snow makes for some damn good pictures), don't shy away from winter. For the record, roads close November 1st (or earlier, depending on weather — in 2016, they closed around October 15th). It's very, very, very often foggy here, and the lake regularly can't be seen. Something about how the fog settles into the lake due to gravity and stuff. If you're making a trip, check the park's website, the camera, the forecast, and leave wiggle room in your itinerary to change days should you need to. It'll be a serious bummer if you don't get to see it. If you're not planning a trip, check out the park's 24-hour camera on the lake anyway. Bring a wide-angle lens if you have one. This baby is 5 by 6 miles across. Staying in the park at Crater Lake Lodge is obviously a good choice, but as far away as Medford or Klamath Falls works, too. Bonus if you stay in Union Creek and get pie at Beckie's Café. Final note: How's this bad boy rank? Oh, man. Probably behind Glacier and Yellowstone, but right up there with Yosemite.